2014 Science Unbound Foundation’s Best Paper in 2013, PMID 23616257. 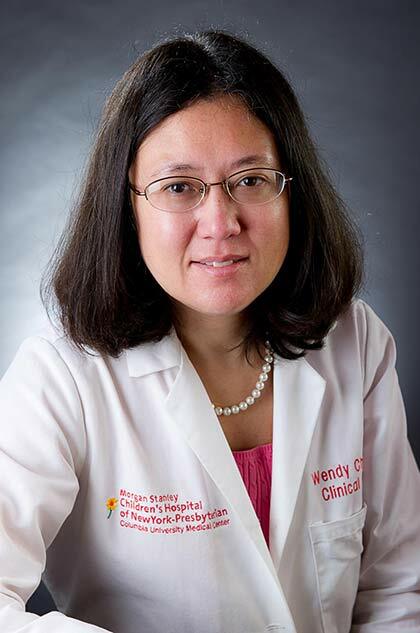 Wendy Chung, M.D., Ph.D. is a clinical and molecular geneticist and the Kennedy Family Professor of Pediatrics and Medicine. She received her B.A. in biochemistry and economics from Cornell University, her M.D. from Cornell University Medical College, and her Ph.D. from The Rockefeller University in genetics. Dr. Chung directs NIH funded research programs in human genetics of birth defects including congenital diaphragmatic hernia, congenital heart disease, and esophageal atresia, autism, neurodevelopmental disorders, pulmonary hypertension, cardiomyopathy, obesity, diabetes, and breast cancer. She leads the Precision Medicine Resource in the Irving Institute at Columbia University. She has authored over 300 peer reviewed papers and 50 reviews and chapters in medical texts. She was the recipient of the American Academy of Pediatrics Young Investigator Award, the Medical Achievement Award from Bonei Olam, and the New York Academy Medal for Distinguished Contributions in Biomedical Science. Dr. Chung is renowned for her teaching and mentoring and received Columbia University’s highest teaching award, the Presidential Award for Outstanding Teaching. She led the pilot newborn screening study of spinal muscular atrophy in NY that helped lead to nationwide adoption of this test in newborns. She was the original plaintiff in the Supreme Court case that overturned the ability to patent genes and served on the Institute of Medicine Committee on Genetic Testing. Dr. Chung enjoys the challenges of genetics as a rapidly changing field of medicine and strives to facilitate the integration of genetic medicine into all areas of health care in a medically, scientifically, and ethically sound, accessible, and cost effective manner. Scientifically, my main contributions have been in the discovery of new genes for human diseases and characterization of the mutation spectrum and molecular mechanism of disease, clinical characterization of the disorders associated with these gene mutations, and integration of these discoveries into clinical practice through the development and implementation of clinical genetic testing in medical care. The number of diseases I have studied and continue to study is much larger than most other geneticists and span rare disorders causing neurodevelopmental disorders (including autism and spinal muscular atrophy) and birth defects (congenital heart disease and congenital diaphragmatic hernia), cardiopulmonary conditions (pulmonary hypertension, cardiomyopathies, arrhythmias), cancers (breast and pancreatic cancer), rare inborn errors of metabolism, and complex diseases (obesity and diabetes). In all, I have identified over 25 new genes for human diseases. I began my research focus on the inherited basis for the common metabolic conditions of obesity and type 2 diabetes. We study both common and rare genetic variants increasing susceptibility to obesity and diabetes, I have characterized over 250 patients for monogenic forms of diabetes using whole exome sequencing. I have also studied several rare inborn errors of metabolism and identified novel mutations and associations for Wolfram syndrome, Wolman disease, Leigh syndrome due to Ashkenazi Jewish founder mutations, and the novel associations of MELAS and glycogen storage disease type III with pulmonary hypertension. We study the genetic basis of birth defects including congenital diaphragmatic hernia and congenital heart disease. My cardiac studies include pulmonary arterial hypertension, inherited arrhythmias and cardiomyopathies and others. In collaboration with the Motor Neuron Center, our Spinal Muscular Dystrophy study led to a new paradigm for early diagnosis and intervention for the second most common hereditary cause of death in infants. Cancer research includes working on inherited cancers such as breast cancer, pancreatic cancer, as well as rare cancer syndromes. I have identified numerous novel genes for neurodevelopmental disabilities and autism and characterized the associated neurocognitive and clinical phenotypes. I have been involved in understanding how genetic information impacts patients and providers including their medical and reproductive decisions as well as the psychosocial impact of this information on patients and their families. I have been a leader in the use of whole exome and whole genome sequencing as a discovery tool and for clinical care. I am a member of the Columbia Electronic Medical Records and Genomics (eMERGE) investigators funded by the NIH to study the integration of genomic medicine in the electronic medical record (EMR). I play the critical leadership role in the Irving Institute in organizing and supporting these activities across Columbia, developing systems, policies, and governance to provide an efficient research infrastructure to accomplish the goals of Precision Medicine and to catalyze the careers for young investigators by providing the necessary training and ability to access data biospecimens and analytic techniques to launch research careers and programs. Center for Research on the Ethical, Legal and Social Implications of Psychiatric, Neurologic and Behavioral Genetics (PI: Appelbaum), RM1HG007257-06, 09/17/18 – 06/30/22, Center for Research on the Ethical, Legal and Social Implications of Psychiatric, Neurologic and Behavioral Genetics, Wendy K. Chung, MD, PhD. Co-Investigator. To support a center to promote research and training on ELSI issues in psychiatric, neurologic and behavioral genetics. Screening for Cardiac Amyloidosis with Nuclear Imaging in Minority Populations (PI: Maurer), R01 HL139671-01A1 SCAN-MP, Wendy K. Chung, MD, PhD. Co-Investigator. Responsible for coordinating activities at Columbia University Medical Center. Health Care Provider Responses to Receiving Unsolicited Genomic Results (PI: Holm, Ingrid Adele), 1 R01 HG010004-01A1, $922,828, 07/01/18 – 4/30/19, Wendy K. Chung, MD, PhD. Co-Investigator. Responsible for coordinating activities at Columbia University Medical Center. PTEN-CFTR interactions regulate pulmonary inflammation in Cystic Fibrosis – a Potential Target for Therapy (PI: Prince), $40,000. Irving Institute/Integrating Special Populations (ISP) Pilot Award. 06/01/17 – 5/8/18, Wendy K. Chung, MD, PhD. Co-Investigator. Responsible for performing the genetic analysis of the PTEN locus. Molecular Genetic Analysis of Human Obesity (PI: Leibel and Chung), R01 DK52431-21A, $302,145, 09/24/16 – 08/31/21, The major goal of this project is to identify the genes that mediate susceptibility to obesity in humans. Wendy K. Chung, MD, PhD. Principal Investigator. Responsible for all aspects of the study design and execution for the research study in the proposal. Genomic analysis of congenital diaphragmatic hernia (PI: Chung and Shen), NIH –NHLBI 1X01 HL132366-01, 09/01/15 – 08/31/19, The goal is to elucidate the underlying genomic architecture of CDH by performing whole genome sequencing on parent child trios and RNA sequencing of diaphragm tissue in a clinically well characterized cohort to identify de novo mutations and inherited rare variants. Wendy K. Chung, MD, PhD. Co-Principal Investigator, Responsible for clinical characterization of patients, and defining new clinical syndromes as well as directing the biorepository and distributing samples for whole gene sequencing. Gene Mutation and Rescue in Human Diaphragmatic Hernia. (PI: Donahoe), 1P01HD068250-01 NIH/NICHD Program Project, 6/01/2011 - 5/31/2016, (No Cost Extension May 2017), The goal is to uncover the mutations causing Congenital Diaphragmatic Hernia by linkage, gene expression, bioinformatic prioritization of genes and proteins, exome/genome sequencing of probands & trios, and functional work in multiple animal models. Wendy K. Chung, MD, PhD. CoInvestigator, Responsible for clinical characterization of patients, and defining new clinical syndromes as well as directing the biorepository and distributing samples for whole gene sequencing. The Virome of Manhattan: A Testbed for Radically Advancing Understanding and Forecast of Viral Respiratory Infections (DARPA) (Shaman), BAA-US Army, 12/01/16-11/30/19, $11,998,963, Wendy K. Chung, MD, PhD. Co-Investigator is responsible for helping coordinate subject sampling and will contribute to project epidemiological and genomic analyses. Columbia GENIE (GENomic Integration with EHR) (PI: Gharavi, Hripcsak and Weng), NIH - NHGRI 1U01HG008680-01, 9/1/15-5/31/19, $540,000, The goal of this project is to utilize the electronic medical record to implement genomic medicine. Wendy K. Chung, MD, PhD. Co-Investigator, is responsible for medical genetic aspects of the studies and returning results to patients. Goals and Practices for Next Generation Prenatal Testing (PI: Johnston), NIH- NHGRI 1R01 HG008805-01A1, 8/10/15 – 5/31/18, $264,157 (subcontract to Columbia $23,540), Wendy K. Chung, MD, PhD. Co-investigator, will participate on the Steering Committee and act as an advisor with special attention to the development of the Work Group meeting agendas and analysis of those meetings. Dr. Chung will advise on next steps following analysis of the Work Group meetings. She will provide detailed feedback in preparation of the project’s draft analysis and recommendations. Returning Genetic Research Panel Results for Breast Cancer Susceptibility (PI: Bradbury), NIH - NCI/NHGRI R01CA190871-02, 9/9/14-8/31/18, $398,917, Wendy K. Chung, MD, PhD. Subcontract PI, Co-Investigator, Responsible for overall coordination of genetic studies to evaluate the risks, benefits, utilities and costs of returning multiplex genetic research results for breast cancer susceptibility to geographically and sociodemographically diverse research populations. Functional imaging and eating behavior among FTO genotypes in pre-obese children (PIs: Rosenbaum and Mayer), NIH – NIDDK R01 DK097399, 9/18/13-8/31/18, $399,670, Wendy K. Chung, MD, PhD. Co-Investigator. Responsible for genotyping. Center for Research on the Ethical, Legal and Social Implications of Psychiatric, Neurologic and Behavioral Genetics (PI: Appelbaum), NIH - NHGRI 1P50HG007257-01, 4/1/13-3/31/18, $716,651, Wendy K. Chung, MD, PhD. Co-investigator, Responsible for all aspects of the study design and execution for the research study in the proposal. The Impact of Genetic Testing for Cardiomyopathies in Children and Their Families (PI: Chung), Children’s Cardiomyopathy Foundation, 2/1/17 – 1/31/18, $7,250, Wendy K. Chung, MD, PhD. Principal Investigator. Responsible for overall study design and execution. Hormonal, Metabolic and Signaling Interactions in Pulmonary Arterial Hypertension (PI: Loyd), NIH -NHLBI HL108800-04, 7/1/12-6/30/17, $1,782,360 ($54,151 subcontract), Wendy K. Chung, MD, PhD. Co-Investigator, Responsible for recruitment and clinical characterization of families with hereditary pulmonary hypertension for projects 1 and 2. Prenatal Cytogenetic Diagnosis by Array-based copy number Analysis (PI: Wapner), NIH – NICHD 5 U01 HD055651-09, 7/1/12-6/30/17, $ 1,572,369, Wendy K. Chung, MD, PhD. Co-Investigator, Responsible for the planning and supervising all follow up studies. Psychosocial Impact of Genetics in Epilepsy (PI: Ottman), NIH – NINDS R01NS078419-04, 4/1/12-3/31/17, $343,783, Wendy K. Chung, MD, PhD. Co-Investigator, Responsible for all clinical genetic testing and counseling and advising on impact of genetic testing on patients. Breast Cancer Family Registry Cohort (PI: Terry, Hopper, Andrulis, Daly, John), NIH –NCI UM1 CA164920, 09/1/12-8/31/17, $447,837, Wendy K. Chung, MD, PhD. Co-Investigator, Responsible for all clinical genetic and advising on medical and behavioral issues in following the breast cancer cohort. Simons Structural Variant Project (PI: Chung), Simons Foundation 337701, $6,700,000/year across all centers ($165,764 Chung study site), 3/1/10-7/31/17, The goal of this project is to characterize patients with 16p11 deletions and duplications for their associated medical problems, growth including obesity, dysmorphic features, neuropsychological testing, and structural and functional brain imaging. Wendy K. Chung, MD, PhD. Principal Investigator, Responsible for overall coordination of all studies across all sites. Clinical and Translational Science Award U54 (PI: Henry Ginsberg), NIH/NCATS U54 TR00187 3-01, 07/01/16 – 06/30/21, $8,261,483, The goal of the Irving Institute CTSA is to transform the culture of biomedical research enabling CUMC investigators to develop new treatments faster and deliver those treatments to patients more efficiently, and safely than ever before; to utilize medical research advances to benefit patients and the community, converting knowledge into practice; and to recruit, train, support and nurture the next generation of clinical and translational investigators in multi- and interdisciplinary team science environments. Wendy Chung, MD, PhD (3.00 calendar months) is the Project Lead of the Precision Medicine program in the Irving Institute. She will lead and coordinate all the Precision Medicine programs within the Irving Institute. Strengthening Public Health Infrastructure for Improved Health Outcomes (PsI: Goldstein, Rubin, Hripcsak, Gharavi, Kaushal, Ross) 1UG3OD023183-01, $3,716,357, Columbia/Cornell/Harlem Hospital Precision Medicine Initiative HPO, The goal of this project is to build a research cohort to enroll 10,000 subjects in the national PMI biobank. Wendy K. Chung, MD, PhD. Co-Investigator, is responsible for supervising recruitment of children and return of results. New York Obesity Research Center (PI: Leibel), NIH - NIDDK P30 DK026687-36, 04/01/16-3/13/21, $749,848 ($143,626 Molecular Biology Core), New York Obesity Research Center: Co-Director of the NYORC Molecular Biology Core (Chung), This core provides assistance to qualified investigators in the application of molecular biology & molecular genetic techniques to studies of energy metabolism in animals and man. Wendy K. Chung, MD, PhD. Co-Investigator, Core Lab Director, is responsible for the supervising genotyping and sequencing within the molecular genetics core and providing consultation to investigators in study design and consultation and instruction to users. Newborn screening for Spinal Muscular Atrophy (PI: Chung), Biogen Idec, $758,000, 7/1/14-12/31/17, Wendy K. Chung, MD, PhD. Principal Investigator, Responsible for overall study: establish all of the study protocols, development of educational materials, supervise study recruitment and sample flagging, and supervise the program to return results to parents. Pediatric Neuromuscular Clinical Research Network for SMA Clinical Trials (PI: DeVivo), Spinal Muscular Atrophy Foundation, 7/1/04-6/30/17, $210,556, The goal of this project is to establish a clinical research network that clinically and molecularly characterizes patients with spinal muscular atrophy at baseline and establishes methods of monitoring clinical efficacy in preparation for SMA clinical trials. Wendy K. Chung, MD, PhD. Co-Investigator is responsible for the performing all molecular genetic studies and maintaining the genetics core. Molecular approaches to gene identification in congenital heart disease (PI: Chung), NIH – NHLBI U01 HL098163-01, 9/1/16/16-8/30/21, $85,000, The goal of the project is to identify the genes that mediate susceptibility to congenital heart disease in humans. Wendy K. Chung, MD, PhD. Co-Principal Investigator, Responsible for overall coordination of genetic studies. Genes, Environment, and Breast Cancer Risk: The 15 year follow-up of the Breast Cancer Family Registry, (PI:Terry, Hopper), NIH – NCI 1R01CA159868-05, 7/01/11-4/30/17, $1,968,016, Wendy K. Chung, MD, PhD. Co-Investigator is responsible for the clinical evaluation of all subjects and interpretation of genetic test results. Gene Mutation and Rescue in Human Diaphragmatic Hernia, 1P01HD068250-06A1 (Donahue), $150,000 annual, 9/1/17 – 8/31/22, 1.8 calendar, Wendy Chung, PI for project I to identify genes for CDH and characterize the human diseases. Developmental Mechanisms of Trachea-Esophageal Birth Defects, 1P01HD093363-01 (Zorn), $110,656 annual, 9/1/17-8/31/22, Wendy Chung, PI for project I to identify genes for esophageal atresia and charactize the human diseases. Integrate cancer genomics data in genetic studies and diagnosis of developmental disorders (PI: Shen), NIH-NHGRI R01 GRANT12008885, Goal: This study aims to improve genetic discovery and diagnosis of developmental disorders by integrating cancer mutations and functional genomics data. The integration is based on deep genetic connections between cancer and developmental disorders, and the large amount of cancer somatic mutations data that is still being accumulated ever more rapidly by international cancer precision medicine effort. Wendy K. Chung, MD, PhD. Co-Investigator is responsible for providing sequencing on individuals with birth defects and neurodevelopmental disorders and assisting with medical correlation/interpretation of the genomic information.